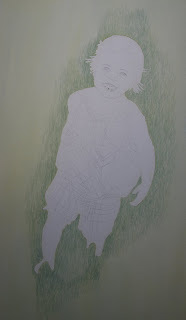 This is an update of the toddler portrait I am working on. It is much larger but just tried to take a photo of the main area that I have worked on so far. The grass has been roughed in around her as I had masking fluid on the edges of her to protect her from the green background. Several layers of grass will be built up in varying tones of green and a few wildflowers will be lifted out near her feet. Masking fluid is still on her teeth and the highlights in her eyes so looks a little funny right now but hopefully in the next update it will look better. I will leave the grass for now and focus on her more.